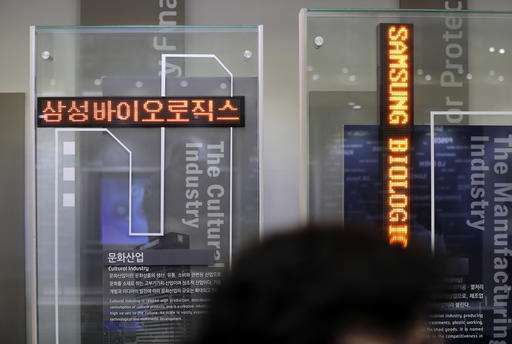 Samsung Biologics Co., the contract drug making unit of Samsung Group, made its market debut in Seoul on Thursday in South Korea's largest initial public offering in six years. Samsung is looking to biotech to be a new core business on a par with its semiconductor manufacturing. The company has included bio tech and health care in the five businesses it named as future growth engines for the next decade, to counter slowing growth in its key consumer electronics businesses. Just as it has made huge profits suppling microchips to Apple and other tech companies, Samsung believes it can supply biologic drugs to global pharmaceutical companies. There is also a leadership transition at play. Growing Samsung Biologics will test the mettle of Lee Jae-yong, the 48-year-old Samsung heir, who is poised to take over leadership of South Korea's largest business group. There's a precedent: In the 1980s, Samsung Electronics' venture into the memory chip business helped establish Lee's father Lee Kun-hee, now 74 and ailing, as Samsung's chairman. Here are details of Samsung's foray into the biologic drugs sector. Biologic drugs are based on living cells and tissues rather than chemicals. Samsung Biologics makes those drugs for big global pharmaceutical companies. Samsung Bioepis, an affiliate of Samsung Biologics, does research and development of biosimilars, or cheap copies of biologic drugs, to be manufactured by its parent company. —WHY IS SAMSUNG BETTING ON BIOLOGICS? Samsung Biologics was set up in 2011. Samsung is confident the business will yield quick profits because it is similar in nature to outsourced manufacturing of semiconductors. Both businesses require massive capital investments in factories to meet future market demand. Both microchips and biologic drugs based on living cells require rigorous quality control in tightly controlled environments. Samsung has excelled at building such factories with unprecedented speed and at cutting costs. Such strengths would give it an advantage in the biologic drugs sector. Samsung plans to use part of the proceeds it raised from the stock offering to complete its third factory, which is expected to cost $740 million. Once it goes online in 2018, Samsung Biologics will become the world's biggest supplier of biological medicines to global pharmaceutical companies by annual capacity, surpassing the two largest contract drug makers, Lonza of Switzerland and Boehringer Ingelheim of Germany. —HOW DID THE IPO GO? 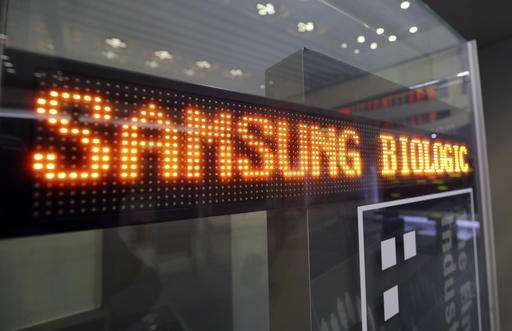 After raising $2 billion in its initial public offering, Samsung Biologic's shares jumped 6.7 percent on the first day of trading, putting the company's market value at $8.3 billion. The gain in the market value of Samsung Biologics boosts Samsung C&T, a de facto holding company of Samsung Group, which is the biggest shareholder of the biologics unit with a 43.4 percent stake. Lee Jae-yong has a strong incentive to build on that, as he holds a 17.1 percent stake in Samsung C&T. Samsung Electronics, the world's largest maker of memory chips, smartphones and TVs, owns a 31.5 percent stake in the drug maker. —HOW IS SAMSUNG BIOLOGICS DOING? It has not been profitable. During the first half of this year, its net loss was 75.7 billion won ($65.9 million) on 136.3 billion won ($118.7 million) in revenues. In 2015, it posted a net profit despite a 203.6 billion won ($177.2 million) operating loss, thanks to one-time profit from a change in how it records its investment in Bioepis. It reported 2015 sales of 91.3 billion won ($79.5 million). Samsung estimates annual market growth for biological drugs at 9 percent, outpacing the overall drug market growth of about 4 percent. By 2020, the global biologic drug market is forecast to rise to $314.8 billion from $204.8 billion last year, according to data Samsung submitted in regulatory filing. Some analysts question whether Samsung Biologics really merits an $8 billion valuation, but Park Si-hyoung, an equity analyst at Baro Investment & Securities, puts the company's value at 10.5 trillion won ($9.1 billion) taking into account its future manufacturing capacity and drugs in the Bioepis pipeline.